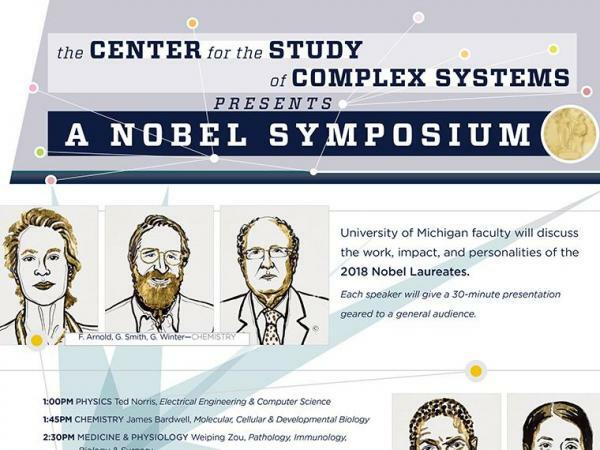 An afternoon symposium where you will learn about the 2018 Nobel prizes from University of Michigan professors. 1PM PHYSICS - Ted Norris - Electrical Engineering & Computer Science will discuss the Physics prize shared by UM Emeritus Gérard Mourou and his then protegee Donna Strickland; and Arthur Ashkin. They are all recognized for their work on 'Tools made of light'. 1:45PM CHEMISTRY - James Bardwell - Molecular, Cellular & Developmental Biology, will discuss the Nobel Prize in Chemistry winners which include Frances H Arnold - for her work on the 'directed evolution of enzymes'; and George P. Smith and Sir Gregory P. Winter for 'the phage display of peptide and antibodies'. 2:30PM MEDICINE - Weiping Zou - Pathology, Immunology, Biology & Surgery, will discuss the prize being awarded to James P. Allison and Tasuku Honjo 'for their discovery of cancer therapy by inhibition of negative immune regulation'. 3:15PM ECONOMICS - Ellen Hughes-Cromwick - UM Energy Institute, will discuss the work of Prize recipients William D. Nordhaus and Paul M. Romer - for 'integrating climate change' (the former) and for 'integrating technological innovations' (the latter) 'into long-run macroeconomic analysis'. 4PM PEACE - Ragnhild Nordaas, Political Science - will talk about the work of Denis Mukwege and Nadia Murad, who both focus on 'courageously combating war crimes and seeking justice for victims'. Each presentation will be 45 minutes (30 minutes presentation, with approx. 15 minutes questions and discussion). Illustrations of Nobel Peace Prize Winners reprinted with permission of the illustration artist Niklas Elmehed. Copyright Nobel Media.